LOL I couldn't help but reply to this because I really wanted to know what it said earlier on in the tour and then my friend couldn't read the last word-it says 'F*** the begrudgers ' If anyone didn't know! I love it! 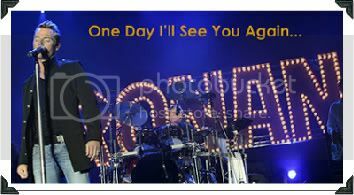 I'll see if I can find the photo when I put my tour photos on my pc. Ah bless... if you got that right then that's pretty sweet. It would be interesting to see a photo. No, that Livestrong photo wasn't Ronan... not sure where Karen found it but it was probably spread by someone who didn't know what they were talking about. It was the begrudgers bit that no one got...they were all trying to guess and I took one look and they all started shouting at me ..how did you know that? We were looking at is for ages...that's how I remember. I'm not sure if she used the camera to zoom in on it or not. We took it at Brighton. I'll try to put them on soon and will post the pic here even if the pic isn't zoomed in I'm sure someone can alter it. Thanks for that. I love what it says. Love it. Love him. Talk about making a bold statement! Thanks for the photo, great that we finally know what the tattoo says. Its quite telling, for him to get that statement written on his arm all the nastyness that comes from his hometown must really get to him. In Ireland they say that there is a tendency to knock people who do well for themselves (the tall poppy syndrome), they are called begrudgers. Over the years Ronan has had more than his fair share of this, especially after what happened last year, things got a lot worse for him over there. 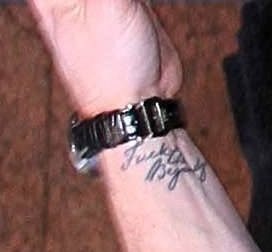 Ronan's tattoo is him saying "I don't care what you say about me".